Ladies... I have found heaven, well the closest thing to it. And it is located right in the heart of the city, situated in one of the most glamorous and stunning looking hotels I have ever walked in to. Since I was little I have been obsessed with being in hotels, I don't know if it was because in my younger years, holidays were spent in a caravan. Don't get me wrong I loved it I love it, but when you have 5 people in a small space where you have to turn pretty much any surface into a bed at night time, the idea of a big fancy hotel used to be complete fantasy! I was captivated by the idea of the sweeping reception halls, the trolleys that the immaculately dressed bell boy would pop luggage on, and the grand dining rooms that the films showed me. 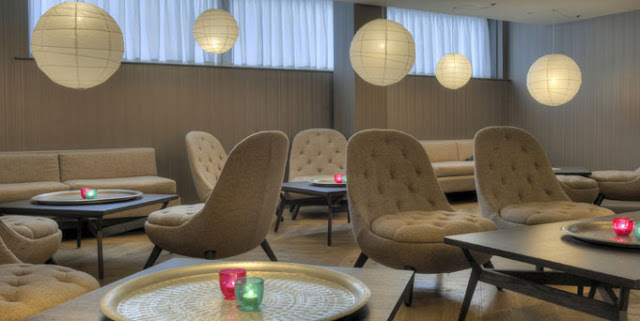 Getting older, I have not lost this passion and love having a nosey in any hotel I can, of course my lifestyle currently affords me stays in your average Travel Inn or Holiday Inn but even staying in these is wildly exciting to me! 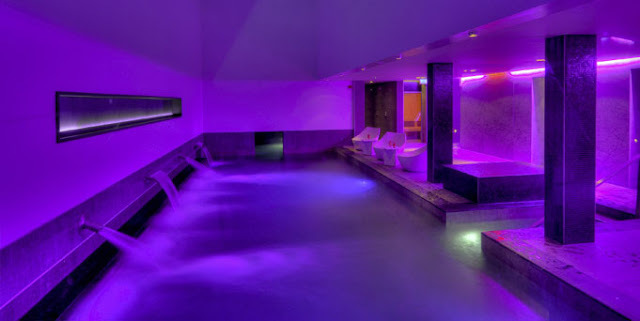 So you can imagine my amazement at getting the chance to visit the Spa located within the 5 star Blythswood Square Hotel, I have never been to a proper spa before and this was quite the way to break me in! The moment I stepped out the lift I knew I was in for an incredible time, your senses are instantly met with gorgeous soft lighting and a delicate blend of relaxing scents, visually everything just looked so luxurious and inviting. The reception staff were a delight, welcoming us in and explaining the whole experience to myself and my mum who was coming along for the ride. They made us feel incredibly VIP which was such a treat,and something that really added to the over all experience. We were led down to the changing rooms and I was blown away with the attention to detail. There was a perfectly sized area for beautifying yourself post treatment, hairdryers, cotton buds and pads, and huge mirrors with great lighting and lots of counter space so no one is cramped in. The set up is fantastic- you get a locker pre prepared with a bottle of water, towel, flip flops and gown for your visit, you literally don't need to bring anything bar your swimming costume which I loved, it made it all feel so effortless, which is exactly what you want at a pampering experience. You set your own code on your lockers ( total peace of mind! ), pop on your flip flops, grab your towel and head on through to the thermal experience, something I will never forget! 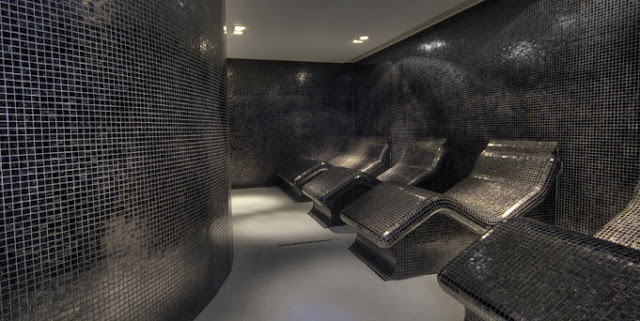 As you go through you are met by what feels like a luxurious underground bunker, it felt sumptuous and private and utterly decadent to have different relaxation rooms to try out. What I loved about it, is the choices that are on offer, my mum is not a fan of extreme heat and so doesn't love a sauna or steam room- but here that didn't mean she was restricted to just a pool! 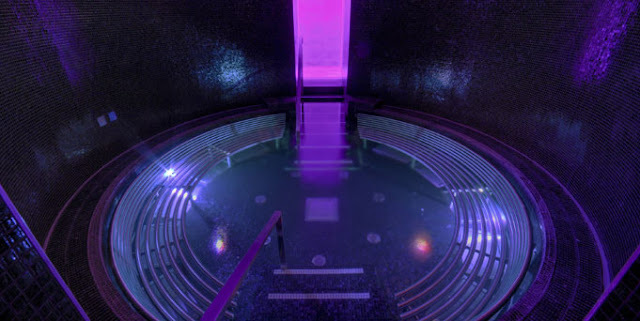 The Laconium was perfect for her as it was a warm but by no means sweltering hot room, we could sit in here for some time and it wasn't too much for her at all, just incredibly relaxing, while gently warming your body up. I then went off and explored the Crystal steam room which was glorious, I have previously been put off by steam rooms finding them too uncomfortable and actually a little scary but this one was really different, the air was manageable as it was coming from a centre point in the room, which felt like it created more space to breathe properly which helped me to just sit back and let the steam do its magic on the skin. I felt amazing as I came out of here and into the pools area to join my mum who was very happily sitting beside a body jet getting a pretty impressive shot of massage to her achy joints, getting in the warmth of the pool was lovely against the skin and It was blissful to alternate swimming the length of the pool with just floating and letting the various jets just help wash all the stresses away. The last stop we took and something I think is a fantastic addition to the journey is the Tepidarium, which is just a dry tepid room really close to the body's own temperature where you can lie back and let your body get back to normal after such a soothing experience I needed this room to wake myself back up! This got us ready for putting our robes on and heading back up to the couch area and enjoying a delicious pot of Green Tea ( they also offer a delightful looking afternoon tea of various sizes) before Mum headed off for a treatment and I went off for a really unique experience- a seaweed bath! So many products now have the healing addition of seaweed in them the chance to have a bath of it seemed like a wonderful idea. I was left in a the BIGGEST tub you have ever seen, with a nice warm bath ready for me with seaweed fresh from the Hebridean Islands submerged in it. The therapist explained all the benefit and then left me to soak and just take in all the nutrients. With candles lit and some peace and quiet I sat back with a magazine and just took it all in, I pretty much had to be dragged out of it afterwards. 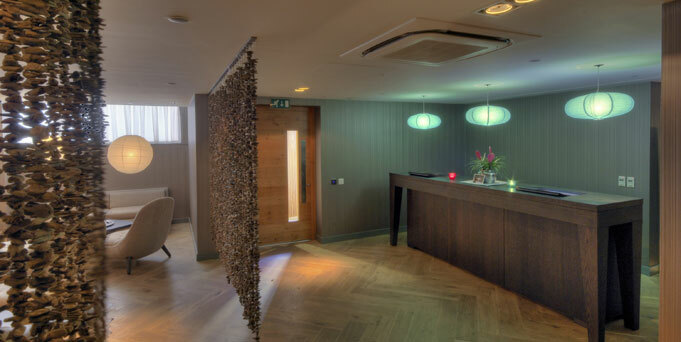 All in all I cannot recommend heading to the Blythswood Spa enough- it is one of the nicest experiences I have ever had and I was reaping the benefits afterwards. The alternation between hot and cool areas is amazing for opening up the pores and absorbing product used afterwards, I was glowing for days and that seaweed back left my skin like pure silk! Since my visit showering just isn't enough, I have never felt so good! Thanks to the whole team at Blythswood for giving my Mum and I an experience to remember. I loved it so much I am heading back shortly so keep your eyes out for a review of my next adventure. Day paid for by the lovely mothership along with some vouchers given at an event. All opinions are one hundred percent my own and totally honest.